Datuk Seri Najib Tun Razak at the press conference announcing the new Cabinet in Putrajaya earlier today. KUALA LUMPUR: It was a day full of surprises. The tone was set early this morning by an Utusan Malaysia front page that read “Semua diminta bertenang”.The headline ironically had a reverse effect as the local daily speculated about an imminent Cabinet reshuffle. Hot on the heels of an impending cabinet reshuffle, a big surprise emerged from the Chief Secretary to the Government, Tan Sri Ali Hamsa who announced that Attorney-General, Tan Sri Abdul Gani Patail’s tenure had been terminated effective the day before, due to “health reasons”. Former judge of the Federal Court, Tan Sri Mohamed Apandi Ali was announced as Abdul Gani's replacement. Abdul Gani told a news portal that he had not been informed about the decision to terminate his contract prior to the announcement, adding that he did not wish to say anything more on the matter. Still in shock over news about the appointment of a new Attorney-General, the focus of the media and public officials quickly shifted to the Prime Minister’s Office in Putrajaya. 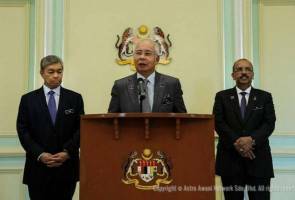 In a press conference held at 1.50pm Tuesday, the Prime Minister, Datuk Seri Najib Razak announced the appointment of Datuk Seri Ahmad Zahid Hamidi as the new Deputy Prime Minister, replacing Tan Sri Muhyiddin Yassin. The cabinet reshuffle involved the appointment of seven new ministers and nine deputy ministers. Najib said that the move to replace Muhyiddin was a difficult decision for him, but it needed to be done to ensure a unified Cabinet. Muhyiddin in a statement following the announcement said throughout his service as DPM, he had always supported government policies and Najib’s leadership. He said it was only on the matter of 1Malaysia Development Berhad (1MDB) that they had differences. The list of new appointees to the Cabinet included Pulai Member of Parliament, Datuk Nur Jazlan Mohamed, who is also the Public Accounts Committee (PAC) Chairman. He was appointed Deputy Home Minister. Nur Jazlan said he would let go of his post as Chairman of PAC. He also said all PAC proceedings set for August, including those involving the 1MDB probe, would be postponed until the new PAC team is appointed. Last Saturday, he mentioned that the PAC had set the 4th, 5th, and 7th of August to meet with a few of the former Chief Executive Officers of 1MDB, and 17th and 18th of August with a few former Directors. Apart from Nur Jazlan, three other PAC members were given Cabinet positions, namely Datuk Seri Reezal Merican Naina Merican (Deputy Foreign Minister), Datuk Wilfred Madius Tangau (Minster of the Science, Technology and Innovation) and Datuk Mas Ermieyati Samsudin (Deputy Minister of Tourism and Culture). In other news, Nur Jazlan has been dropped from the IDEAS Council effective immediately, upon becoming the Deputy Minister for Home Affairs. According to a press statement by the IDEAS Council, this is because he is now part of the Executive.